responsive Mega Menu is helping power hundreds of customer projects. Get started with it today and find out why it's a popular choice! responsive Mega Menu (rMM) is built for the web of today and tomorrow. It's versatile enough to serve your menu needs in a variety of settings. We've made it easy to use rMM with your projects, simply copy the code from our examples and paste them into your files. Add the CSS and Voilà! you're Mega now! 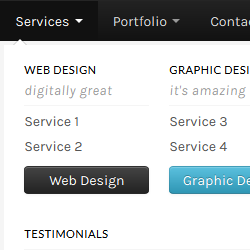 The menu comes with six pre-made color styles to quickly customize the menu to your site. You can embed videos (all major sites supported), images and maps. Plus any other media file! Use up to 6 columns to show your menu items. Single and multi-column layouts supported! Bootstrap works for you in all major browsers, yes even the horrible ones *cough* IE. 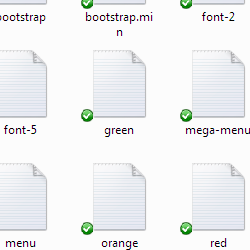 The menu is ready to go on almost any device, since it's Boostrap powered! Using the latest web development technologies to give you a forward moving product. Ultra sharp on any resolution, it's cool to be clear...retina clear! Did we mention it's Bootstrap fueled? Yes, that means you can customize it any which way you like. The columns are grid based and respond to various screen sizes and devices, out of the box! 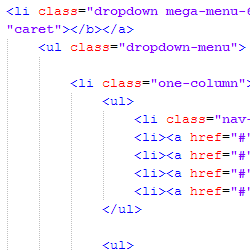 These features and more come with responsive Mega Menu (rMM)! Buy responsive Mega Menu here! Find out more about the menu, view the video to learn more about the features that come with it!